Oreo survived being thrown off a Brooklyn rooftop. 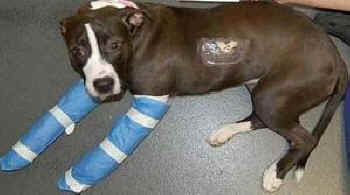 But she could not survive the "rescue" by the ASPCA. The miracle was short-lived. According to the ASPCA, when Oreo recovered from her injuries, she started to show aggression. After a series of temperament tests, the ASPCA made the decision to kill her. The New York Times reported the story the day before Oreo’s scheduled execution. A sanctuary in New York offered to take Oreo, explaining that they had experience rehabilitating dogs deemed aggressive and offering her lifetime care, including plenty of socialization and walks if the rehabilitation was not successful. They were ignored, hung up on and lied to. And the ASPCA chose to kill the dog instead. That afternoon, Oreo laid dead, the victim not of her former abuser, but of an overdose of poison from a bottle marked “Fatal-Plus,” at the hands of a shelter bureaucrat. Oreo and Max are not isolated incidents. Nor is Oreo's Law about pit bulls. It is about saving all animals. 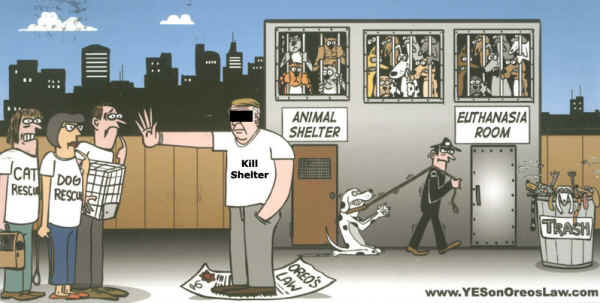 In fact, NYS shelters routinely turn away rescue groups and then turn around and kill the kittens and cats, puppies, dog, rabbits and other animals those rescue groups are willing to save. A statewide survey of rescue groups found that 72% of rescue groups reported being denied animals, and 71% reported shelters turned around and killed those animals. 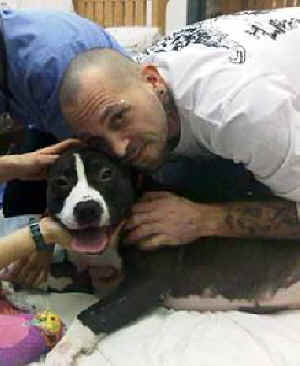 The statewide survey also found that 43% of rescue groups that have expressed concerns about inhumane conditions which they have witnessed in NYS sheters have been the subject of retaliation, while over half (52%) who have witnessed cruelty and neglect at the shelter did not express concerns because they were afraid they would no longer be allowed to resuce, this allowing those inhumane conditions to continue. Oreo's Law would stop unnecessary killing and unnecessary neglect rampant in NYS shelters. Reportedly taken right before they killed her, this photograph shows that Oreo was not the mean, vicious dog she was made out to be. The ASPCA has refused to release the videotapes of Oreo's temperament testing. For far too long, those running our animal shelters – agencies funded by the philanthropic donations and tax dollars of an animal loving American public – have refused to mirror our progressive values. For far too long, they have assumed a power and authority to act independent of public opinion, and the will of the people who have entrusted them to do their jobs with compassion, dedication and integrity. In betraying this trust, they have proven that they can’t be trusted, and that we must regulate them in the same way we regulate other agencies which hold the power of life and death: by removing the discretion which has for too long allowed them to thwart the public’s will and to kill animals who should be saved. Oreo’s Law, thankfully, seeks to do just that. Sadly, we cannot bring Oreo back and give her the second chance the ASPCA denied her. And we will forever remember her killing at the hands of those who were supposed to protect her from further harm as many things: tragic and heartbreaking, chief among them. Nothing can alter that calculus. But we can lessen the futility of Oreo’s death if we learn from it, and alter our society in such a way as to prevent such a betrayal from ever happening again.